In his speech, Sanders, 44, paid tribute to his coaches and teammates, but the highlight of his speech came when he reiterated a promise he made to his mother as a seven-year-old in Fort Myers, Fla.
“I made a promise when I was seven years old to this young woman at the age of 27. She was working two jobs just to see if ends could see one another, cause they never met. And she was slaving over pots and pans on that precise day,” said an emotional Sanders, in front of roughly 13,000 fans in Canton, Ohio. Sanders kept his promise to his mother, Constance Knight, who beamed with pride during her son’s speech. PFP Sports and Celebrity Talent Agency is a speakers bureau and top booking agent for sports speakers, football speakers, athlete appearances, endorsement deals and celebrity bookings. 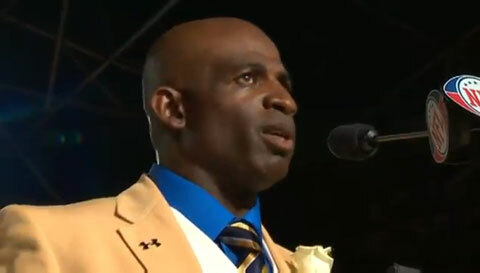 We assist corporations in booking Deion Sanders for corporate events. Call 1.800.966.1380 for Deion Sanders speaker and Deion Sanders booking agent information.